5:00 AM wake-up. Breakfast consisted of a sugar covered sweet potato. I tried something different for race nutrition. I mixed some Ucan and put it in a plastic bag to have during the race. I also brought tailwind in my handheld. The RD sent out a an email yesterday saying that the race was cupless. That was new to me. Cupless is so irritating when I haven't planned for it. I made a raincoat out of a plastic bag so that I wouldn't get too wet before the race. I wore some old shoes and packed the shoes that I planned on wearing for the race. The drive up to the race was spectacular! It wasn't raining too much and the hills were amazing. When I go to the Ranch, I realized that there was no cell coverage. That was going to be a problem because, my husband was going to meet me there after the event. I told him that I would text him when it was over, probably around 11. I was expecting to run about 2 1/2 hours. Everything went smoothly. Packet pickup was a breeze. I got some socks and a shirt that I needed to put in my car. When I got to the car, the rain picked up a little, so I put on my rain jacket and my garbage bag on top of that. I didn't plan on running with the garbage bag, but I planned to wear it up until the race start. There were few instructions before the on-time start. We were warned that there was a lot of poison oak on both sides of the trail, and off we went. This race started out great. The rain was steady, but light and the beauty was overwhelming. The thickness of the mud and the rain steadily increased. At one point, after an incredible climb, there was a DJ, a dance floor and a dancing dinosaur that seemed to appear out of nowhere. That was the demarcation point. After the dancing dino, the race started seeming like work. The mud was sticking to my shoes. The rain got harder and what seemed like a fog descended, so I could no longer see the hills. The mud got thicker, and the rain got harder. 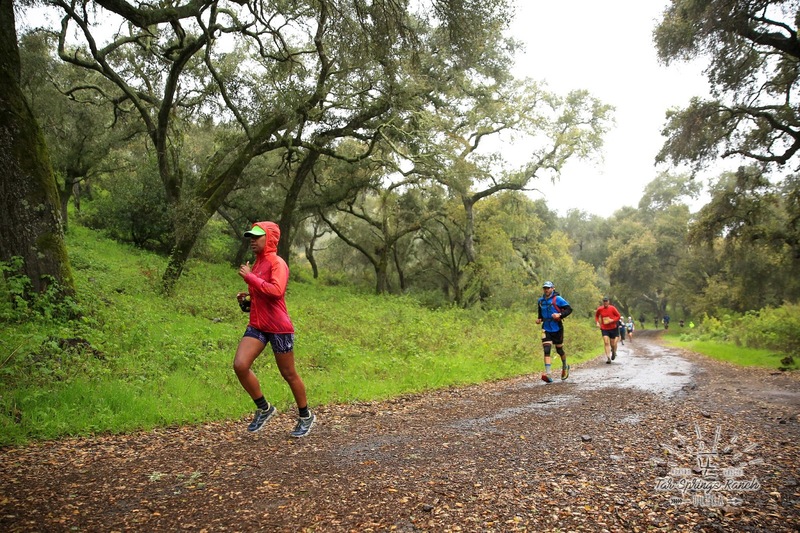 I'm a competitive road racer, but I'm not a competitive trail runner. I walk the downhills whereas most people pick up speed on the downhills. That kind of racing strategy is no way to compete, but I don't have a lot of confidence in my balance under ideal circumstances. Some people did a half slide down the hills on purpose. That surely wasn't going to be my strategy. We were surrounded by poison oak. The trail was just slop, so it was slow going for me. Also, my waterproof socks had filled up with water, so each foot was submerged in its own personal swimming pool. All of the racers started trying to distract themselves by talking and helping each other. We were racing, but we were in it together. By the end of the race, I just wanted it to be over. 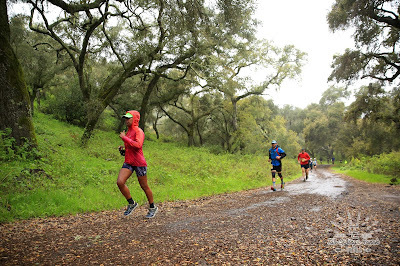 I had had it with the rain, mud and elevation. There was a band, tacos and beer at the finish, but I knew my husband would be worried. I told my husband that I would call him at 11:00 and it was 1:00. Besides that, I was really ready to be done, so I left pretty quickly. My final thoughts about this race is that it was top notch. The parking was easy. The aid stations were fully stocked. The course was accurately marked. There were actually porta potties at a couple of the aid stations. The after-party was good. After I recover a little, I would probably do it again. Celebrating a few hours later!